Flexible spaces let students work in groups and spend less time listening to lectures. When you ask people what makes up a school, you usually get answers like classroom, library, computer lab, cafeteria and gym. The first three spaces are where most people think that learning occurs. Today, we are seeing learning expand beyond these traditional spaces into areas never intended for learning. Corridors and office spaces come to my mind in older schools. 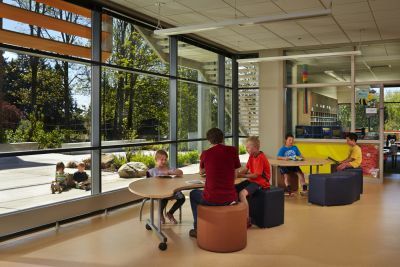 Newer schools are beginning to purposefully create alternative learning spaces because the activities that occur in schools are changing and demanding new spaces. In addition to direct instruction through lecture, students are increasingly working on projects, collaborating in small groups and presenting what they know using many different media. Formal spaces like classrooms and libraries are still important, but now a host of other spaces are settings for learning. 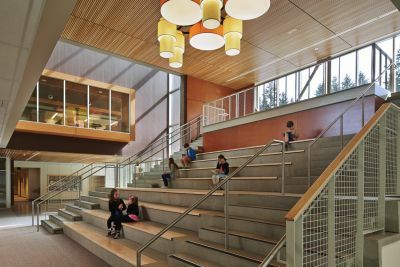 Shared spaces such as those found at the new Sandburg Elementary School in Lake Washington School District, while not formal instructional spaces, are increasingly used to provide flexibility for teachers and students. A variety of furniture types allows small groups, teams working on projects, or students studying individually to use these spaces while adjacent relites keep the students visible to teachers in adjacent classrooms. Shared spaces are increasingly used for flexible study or small group areas. Another semi-formal space is the learning stair at the new Cherry Crest Elementary School in Bellevue School District. Several classes or small groups of students use these stairs not only for presentations but also for small groups and individual reflection. They are also a gathering space, a great place to be and the social center of the school. Corridors are a fact of life in most schools but some educators and designers are creating schools without corridors to create as much enclosed learning space as possible. These schools feature learning studios rather than classrooms. Spaces in the learning studios are delineated informally with furniture and movable partitions. Space under a stair can provide a niche for a student or small groups. Enclosed spaces are still provided for direct instruction, but the teaching paradigm has shifted in these schools. Instead of a teacher working in isolation with one class, teams of teachers work together with multiple classes. Teachers form a professional teaching community that share best practices and coordinate their efforts to organize the large space. These schools are different from the open-plan schools of the 1960s in that they don’t focus on direct instruction and lecture. Instead, the teachers rotate among groups of students working on projects. The space is very agile and can be readily rearranged. There are still rooms provided when lecture is necessary, but since students are predominantly in small groups, the acoustical conditions needed for lecture are not necessary. While some schools are experimenting with no corridors, typical schools are made up of many connecting spaces that can also provide learning opportunities. The space under a stair can be a stopping point for individuals or small groups. 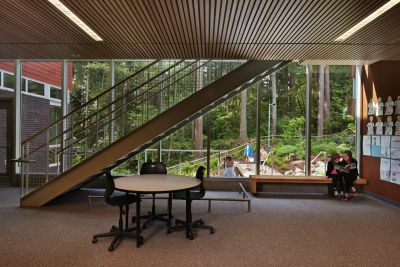 Found space on a balcony becomes a group learning area, and a widened circulation space provides a quiet yet observable oasis for learning. These spaces need to be visible, allowing either direct or passive supervision. Increasingly, learning is extending outside the school to outdoor stairs, gardens and even rooftops. Students use these stairs for presentations, small groups and individual activities. 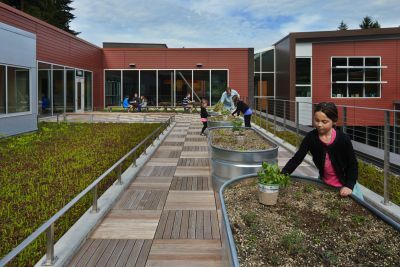 At Cherry Crest Elementary the green roof and terrace is equipped with tubs that teachers can use to teach students how to grow plants, vegetables or flowers. A pathway around the forested site allows teachers to show students features of the forest undergrowth at close range, and in addition provide a pleasant walk around the school. There is also a growing trend to expand the school environment beyond the confines of the school site. This is happening in several ways but two of the more interesting ones are expanding schools into communities and the creation of virtual environments. Students who engage in internships for credit and students engaged in community projects as part of their course work are examples of school moving into the community. Students find internships and community projects to be relevant, engaging and challenging and they often result in an achievement that go beyond the grade they get in a course. The other trend in the expansion of school environments is the creation and growth of what I call the virtual environment. Students and parents have an unprecedented ability through the Web to access classes, teachers, other students and other physical locations. There are virtual worlds like Second Life for Students that offer educational content, as do many university sites. There are also learning communities on the Web that offer students flexibility in the pace and timing of their learning, and are location agnostic  you do not need to be physically located in a place to participate, you can join the community virtually. This rooftop space is equipped with tubs where students can learn how to grow plants. This trend is increasing because it allows unprecedented individualization of instruction. Students can choose to learn using techniques that work for them and can also choose subjects they find compelling. As technology continues to improve, the definition of “learning environment” will become broader. Our job as designers is to enable a variety of learning experiences in the environments we create. Greg Stack is an educational architect, designer and writer, and the K-12 Thought Leader for NAC|Architecture. He has planned and designed numerous K-12, college, university and specialty educational buildings during his 35-year career in architecture.